Chatfield Farms is a 55+ community located in Beacon Falls, Connecticut. This community offers homebuyers quality low-maintenance single-family homes. Residents of the community enjoy a great clubhouse packed with amenities to keep them socially and physically active. The surrounding area offers an abundance of options for shopping and entertainment for active adults of Chatfield Farms. Residents of Chatfield Farms enjoy the luxurious 10,000 square-foot Fieldstone Club that offers plenty of amenities. Those who are looking to stay in shape will love the fitness center with cardiovascular and weight-training equipment as well as the aerobics room. After a great workout, they can relax with a massage or soak in the indoor spa. For the more socially minded residents, the clubhouse offers plenty of opportunities to interact with neighbors in the Club Room, Madison Room, or Chatfield Room to play cards, enjoy community parties, learn a new skill, read a book, or do some creative art projects. They can also play billiards, snooker or darts for some additional fun nights with friends. The amenities continue outside with a heated outdoor pool. Next to the pool is the clubhouse patio complete with a barbeque area and fire pit. Those looking for some friendly competition will enjoy the tennis or bocce ball courts located directly behind the pool. The community is surrounded by nature trails as well as scenic ponds that add natural beauty to the neighborhood. Started by EG Home, Chatfield Farms is slated to offer 231 single-family homes. Homebuyers can choose from five models ranging from 1,445 to 2,048 square feet of living space. Homes offer two bedrooms, two to three bathrooms, and an attached two-car garage. All homes offer great first-floor master suites and some models offer second floors with a bedroom and loft space. These beautifully designed homes have low-maintenance exteriors and open floor plans, great for active adults. Other features include eat-in kitchens and attached rear decks. Chatfield Farms prides itself on offering its residents a great low-maintenance lifestyle. 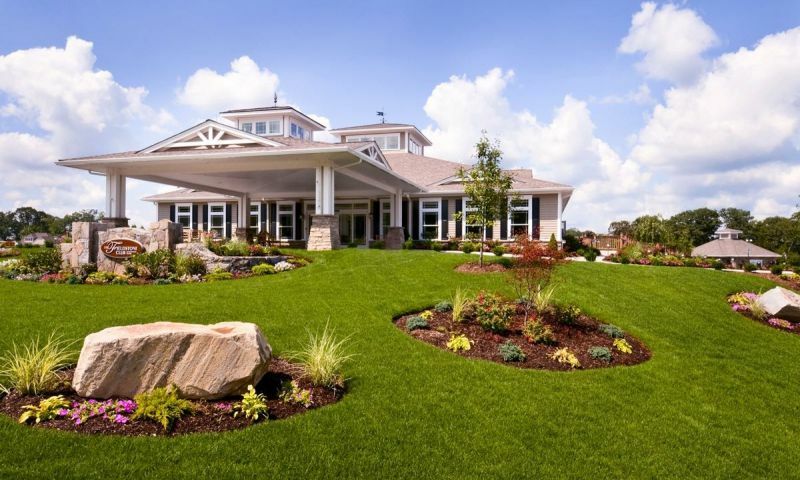 An annual homeowners' association fee covers general maintenance of the community grounds and clubhouse as well as lawn care and snow removal for all homes. This allows residents more time to explore new hobbies or enjoy old ones. Inside the clubhouse residents often meet for any one of the different clubs and activities offered. From workout classes and yoga to card clubs and billiards there is sure to be something for everyone at Chatfield Farms. Chatfield Farms is located in Beacon Falls, Connecticut around the Waterbury area. Residents of the community enjoy this location for its small town charm and close proximity to the coastal shoreline of the Atlantic Ocean. Located less than 20 miles from beautiful coastal beaches, residents often plan days trips to relax in the summer sun. Just off the Ansonia-Derby-Shelton Expressway, traveling to other parts of Connecticut is a breeze. Nature lovers will enjoy all the state parks in the area that offer miles of walking and biking trails through scenic Western Connecticut. Well designed homes in a convenient location with great opportunities for recreation makes Chatfield Farms a premier community for Connecticut's active adults. Fieldstone Club - 10,000 Sq. Ft. There are plenty of activities available in Chatfield Farms. Here is a sample of some of the clubs, activities and classes offered here. Homebuyers can choose from five models ranging from 1,445 to 2,048 square feet of living space. They offer two bedrooms, two to three bathrooms, and an attached two-car garage. All homes offer great first-floor master suites and some models offer second floors with a bedroom and a loft space. These beautifully designed homes have low-maintenance exteriors and open floor plans great for active adults. Other features include eat-in kitchens and attached rear decks. My husband and I love living at Chatfield Farms! Welcoming neighbors, a magnificent clubhouse, woodlands, walking trails, a lake and beautiful homes make this active community absolutely spectacular. We have lived here for four months. The building process was smooth; EG Home completed our lovely home within the time specified. Matt, Adam and Bill were easy to work with, quickly answered all questions and offered valuable suggestions. The homes are extremely well constructed and offer functional floor plans. The design center has a multitude of options, both standard and upgrades are available. The homes have so much charm. We chose the Jefferson because we liked the many large windows which allow us to enjoy the woodlands. The community is peaceful, esthetically pleasing and close to restaurants and shopping. Moving here was one of the best decisions we ever made! We moved in early 2008 and have not looked back since. This was the best decision we have ever made. It's like living in a country club. The residents here are from all walks of life and go out of their way to make everyone feel welcomed. An extremely friendly and active Community! On top of that lawn maintenance and snow removal is part of the deal and our Clubhouse is second to none. We are a growing Community and if your looking for exceptional 55+ living come and see our jewel. Amazingly warm and wonderful folks. You are a member of the community immediately. All you need to bring is a smile. This environment is amazing! We moved in on November 21st and have been completely thrilled with the reception we have received from the builder, his staff, and the residents. We searched all over CT before discovering this community. We live in the beautiful big yellow Jefferson right across from the clubhouse and are very happy with all of the amenities. The home draws you in like a magnet. The caliber of workmanship is unsurpassed and the responsiveness regarding any questions or concerns is consistent and thorough. We have spaciousness without sacrificing warmth and true comfort. I cannot thank my Lee enough for leading me to this jewel. I expect to really enjoy this environment as a new retiree. It is convenient, offers great views, and really "nails it" as far as all that one could possibly want or need. It is with great pride that we are members of this community. My husband and I have been living here for one and half year. We happened to come here by chance and it was the best decision that we made. We absolute love it here, the residents are wonderful and caring. We can't wait to retire so we can enjoy this kind of life, there is something to do for everyone. We absolutely love living here. We have been living at Chatfield Farms for 6 weeks. It is the best move we could have made. The community is just wonderful. The people here are so friendly we felt right at home. The clubhouse offers a wide variety of activities! Thank you EG Homes for this great opportunity. We've recently moved into Chatfield Farms after having researched over 55 communities for months. We were impressed EG builders from the start. Buying a new house can be stressful but all our doubts and fears were relieved after our first encounter with the community at our first pizza party. The clubhouse is fabulous! Chatfield Farms is a wonderful place to start planning for you retirement. We purchased in May 2009 while we were still living in New York. It was a great place to come to every weekend and holiday Now that we are both retired we have plenty of activities in the community to keep us busy. Sometimes I think they put wine in the water because everyone is so happy here. Come take a ride to see all the new models and you too can purchase a beautiful home in this great adult community. Here at Chatfield Farms we are not only a community,but one big family. The people are very friendly and welcome all new neighbors. It is a GREAT Community, lots of activities.Something to do for everyone. Moving to Chatfiels Farms was the best thing we could of done for our retirement years. We are very happy here. We love our home and the community. We feel like we are on vacation all year. This "55 and better" community of individual homes is a wonderful example of what life should be like at this stage of our lives. Spacious homes and property, caring neighbors, plenty of activities to maintain physical and mental fitness, and within a short drive for shopping, dining, and entertainment. My wife and I bought a home here Five years ago and love it. Not to brag but we have acres of rolling hills, a lake, surrounded by woods, and wildlife. The clubhouse is second to none in the northeast. The people that live here are absolutely wonderful. The builders, E&G Homes, are building beautiful very well constructed homes. At Chatfield Farms lawn maintenance and snow removal is included. The grounds and the roads are kept tip top year round. Life is good. We have been living at Chatfield Farms since 2008 and are delighted by everything about the community. Everyone is friendly and welcoming. There are tons of activities to keep people busy all year round. It is easy living at its best!! We have lived in Chatfield Farms for 4 years. It is an absolutely beautiful community. People here are friendly, caring and helpful. We hope you come join us at Chatfield Farms. 55places.com is not affiliated with the developer(s) or homeowners association of Chatfield Farms. The information you submit is distributed to a 55places.com Partner Agent, who is a licensed real estate agent. The information regarding Chatfield Farms has not been verified or approved by the developer or homeowners association. Please verify all information prior to purchasing. 55places.com is not responsible for any errors regarding the information displayed on this website.